Special Olympics North Carolina has training and events throughout the state year round. Volunteers are the heartbeat of our organization and help make Special Olympics possible. There is always something to do. Check out these volunteer opportunities. Offer your services as a medical professional at our free health screenings through the Healthy Athletes program. Not sure how to get involved? Complete this form with your interests and we will contact you! 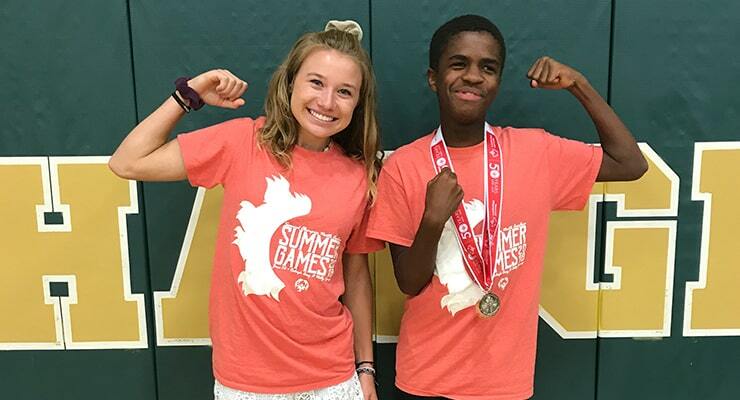 Class A volunteers are volunteers serving in a leadership role with Special Olympics. This is any position of authority in Special Olympics including games management team members, coaches, chaperones, committee members, and anyone handling money on behalf of the organization. Class A volunteers must also complete the 15 minute online Protective Behaviors Training. They must also fill out a Volunteer Screening Form granting SONC permission to run a background check on them. If you are serving in a Class A volunteer role, please reach out to your local coordinator to get the Volunteer Screening Form! We care about your privacy! Please read the SONC Volunteer Privacy Statement to see what we are doing to protect your vital information. Have you signed up to volunteer at one of our events? If you signed up online look in your inbox for an email from volunteers@sonc.net or VolunteerLocal. If you need to cancel please cancel your shift within the VolunteerLocal via the email address that you used to signup. For in-house volunteers please track your time and project here. Being familiar with your job as a volunteer will make you more effective, ensure a quality event for the athletes and make your experience more enjoyable and rewarding. We appreciate your taking the time to review the provided materials. Watch the athletes tell you how to best work with them!